This week our column takes a look at a recent trend in vampire horror and science fiction where vampirism is not so much a supernatural condition or curse, but a science based disease. The works discussed here represent attempt to ground the vampire in a more naturalistic way, explore new societies in post-apocalyptic settings, and ask questions who is more monstrous; the vampires or the humans who have survived them. In near future America an ex-federal agent searches for a girl who may be the key to stopping a viral pandemic. Ninety-three years later a frontier community struggles against the creatures that rule the former United States of America. The Passage genuinely surprised me. I have not been reading many books about vampires, so I dismissed it. That was a mistake. This is a novel that draws you in as it travels through a near future United States of America, a scientific expedition to the jungles of South America, and a post-apocalyptic future that has much in common with the wild west of the 1880s. One interesting feature of this book is that the author uses multiple narrative styles to tell the story, so it includes e-mail, government reports, television transcripts, government proclamations, and a host of other sources that convey a world rapidly spiraling out of control in the face of disaster. This gives a verisimilitude to the world and helps place the events in context. Cronin’s Virals (the monsters of the book) are unique, combining several of the trends of modern horror (viruses, fast moving zombies, psychic powers) to create creatures whose horror is born of science and nature as much as the supernatural. The characters are interesting and well developed, and despite a large cast spread across two time periods, their individual voices never get lost. It mixes fantasy, sci-fi, horror, and touch of the western to tell an epic story about the choices we make to survive, and the costs we are forced to pay. Although it is a complete story on its own, it leaves some questions unanswered so as to set up the next book in the series. 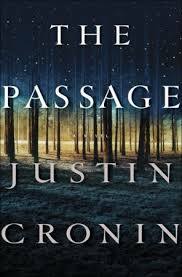 The Passage (2010) is the first book of a proposed trilogy. The second volume, The Twelve (2012), introduced new characters, caught up with old ones, and again switches time periods between the pre and post disaster era. A third volume, The City of Mirrors is forthcoming. A Boeing 777 aircraft lands at JFK with all aboard dead. A CDC team, led by Dr. Ephraim Goodweather investigates, and discovers a mystery that may be the first step in an invasion. Meanwhile an elderly holocaust survivor realizes that a long term enemy has returned. The Strain, and its sequels The Fall and The Night Eternal, depict a modern society under siege by vampires. The vampires in this series are given a more scientific/parasitic origin, but still retain some of the traditional weakness (running water, garlic, …) yet even these are given logical reasons for existing. This book and The Passage share similar ideas, though have different styles, plots, and themes . The Strain was originally conceived as a television series so it features lots of action and a breakneck pace. However, there is still time for character development and I saw some honest surprises I did not see coming. The novels are relatively short, so if longer works like The Passage are not to your taste, this provides a similar story in a more compact style. Also, being firmly grounded in the modern day, allows the reader an immediate connection to the story allowing it to jump right to the thrills. If you like fast action, relatively accurate scientific investigation of the supernatural, and heroes who are everyday sort of folk instead of magical warriors of light, The Strain is well worth a read. The Strain (2009) is the first volume in a trilogy, followed by The Fall (2010) , and The Night Eternal (2011). All three stories are complete, and there do not appear to be any future volumes planned. Additionally, we will have a chance to see the television version as the FX network will be producing a series based upon The Strain for airing July 2014. It is unclear how much of the book will be covered in the first season, and what if any changes will be made to the work. Of course nothing is speculative fiction is truly new. Richard Matheson provided his own version of the viral vampire apocalypse in his novel I Am Legend. This is the story of the last human on Earth, Robert Neville, and his quest to stay alive and sane in a world dominated by victims of a plague (who happen to act a lot like vampires). Hollywood loves this book, and has adopted it three times to the screen: The Italian-American Co-production The Last Man on Earth (1964) with Vincent Price, the 70s remake filled with metaphors on race, The Omega Man (1971) with Charlton Heston, and the special effects laden, big budget blockbuster that misses the point of the original work, I Am Legend (2007) with Will Smith. In my opinion, The Omega Man is the superior film, as no one handles a post-apocalyptic future like late 1960s/early 1970s Charlton Heston.